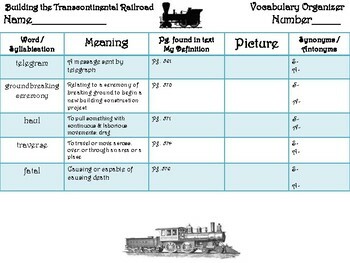 This is a vocabulary organizer that correlates with McGraw Hill's Open Court Unit 5, Week 6 stories "Building the Transcontinental Railroad". 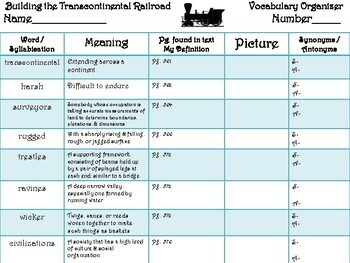 The vocabulary organizer that I have created gives you the option to complete it while reading the selection by stopping as you encounter each term and creating an original definition using context clues, or you can read the selection and then review the terms the students read in the text and create student original definitions. Students are also asked to create an original picture that will help them relate the definition with an image. Finally, students are also asked to identify a synonym and an antonym for each term. These words can be brainstormed as a class, or you could point out how to use the definitions given in the organizer to aid students in identifying synonyms. The organizer could also be given to student pairs and have them complete it together using accountable talk, or the KAGAN strategy "Numbered Heads Together" could also be used to complete the organizer. Then you could lead a class discussion about the words, meanings, and how they are related to the selection. The possibilities are endless! This organizer is only one of the resources I have created to help your students learn the vocabulary for this text. I have also created a vocabulary review sheet, vocabulary cards that can be displayed in your classroom, and vocabulary skit cards that can be used in a center or small group to help make students' learning concrete! These are included in the lesson plan bundle that I have created that will give you everything you need to teach this story including: spelling, phonics, grammar, lesson plans, and comprehension activities. If you need resources for this story this is the bundle for you! Thank you for considering my products. Please remember to leave your TPT feedback to earn your credits!